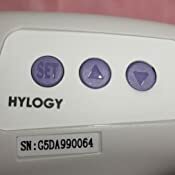 HYLOGY Non-Contact IR Thermometer is specially designed for testing temperature. 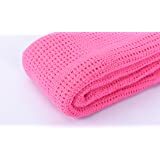 It is especially effective for taking the temperature of baby's or small children without causing them distress or any uncomfortable for them. 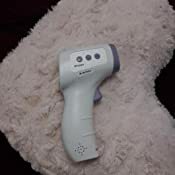 Two modes: Body mode for measuring body temperature;Surface mode for measuring object surface temperature (For Example: bath water,food and milk etc.). 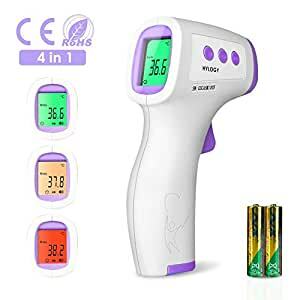 With the most advanced infrared technology, the thermometer can acquire the aim temperature quickly, analyzing the data intelligently and displaying the result within 0.5 second. 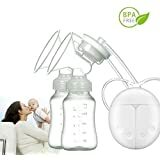 It do not cause any uncomfortable and breed bacteria with the creative design non-Contact any part of the body, especially for baby and elder. - Premium quality, cutting edge technology at affordable price. 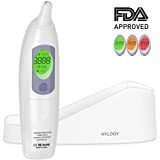 -Both the body and the product need to be balanced in the measurement environment for at least 20 minutes before use. I checked it vs myself - stable result 36.7. Very realistic results. We have 3 other thermometers and we did not trust them, none of them worked so good and showed stable realistic results as this one. We compared it with Classic Thermometer - same results (but Classic Thermometer takes minutes to have result). I tested it vs surfaces - works nice as well (realistic numbers - e.g. showed expected cold walls). 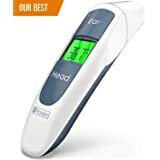 I investigated a lot of thermometers on amazon, considered ones with certifications, made in Europe, US, etc. spent more than hour (as we had issues with 3 old ones, while we have baby and it is important for us to have reliable thermometer). Note: obviously I ignored "High Accuracy" without declared numbers - ±1C could be "High Accuracy" for some people :-) - IMHO no numbers => no trust in this case. 2) most of certified thermometer did not declare accuracy - check yourselves - so I don't trust when they don't take responsibility for most important parameters. 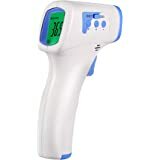 5) good guarantee (2 years), it is possible to find other thermometers with longer guarantee (even life time), but they did not satisfy previous criteria. 2) thermometer made in China. Thank you for reading, hopefully it will be helpful for you and you will spend less time for the investigation. This arrived quickly and reached me in perfect condition. It arrived in a lovely retail box. 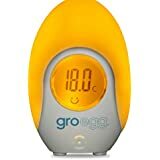 I purchased this as my little ones are often coming down with viruses and I like to keep an eye on their temperature. Quite often I appear to be annoying them when using a standard thermometer. This one however is fantastic. This thermometer is so much easier to use. You need 2 batteries to operate this which is included. I find this to be very accurate and the temperature displayed on the screen is very easy to read. What I love most about this is that you can use this without contacting the patient. So it means that I don't need to disturb the children whilst taking their temperature. You do not need body contact to get a reading. 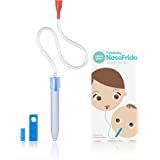 This has got to be the best digital thermometer that I have ever used and I would highly recommend this to other parents. It would also make an excellent baby gift. A fantastic item, very accurate as I checked it against a precision temperature gauge. Arrives in a nice package, when you open it you have the thermometer, user manual (a little small) and also a nice material bag to store it in. It is a shame it didn't come with 2x AAA batteries. Set up was a doddle, it was up and running in seconds. The quality of the casing is very good, for the price I wasn't expecting much. It is perfect for babies, children, teens, adults and EVEN animals. I totally recommend you get one of these before they realise how good it is and put the price up. I have bought a second one for my daughter to use on my granddaughter. 5.0 out of 5 starsGreat easy to use device. I love this device, looked at lots but chose this for price. Extremely happy with ease of use. 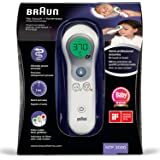 I had a Braun ear thermometer before but this one is much easier to get an accurate reading from. 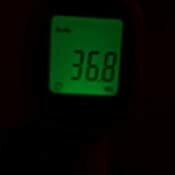 Can also be used check the temperature of surfaces etc. The children love the traffic light system. It's possible to check little ones while sleeping without disturbing too. 5.0 out of 5 starsWe can’t sing it’s praises enough. This device is superb, and we would 10000% recommend this. I think it should be given free to all new parents after-birth. It’s simple to use - you just press a trigger. 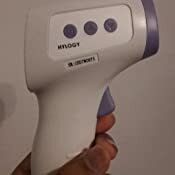 It’s totally non-invasive, it doesn’t need to be in contact with the surface you’re measuring, and it can even be used on surfaces like bath water. The price is surprisingly eminently affordable for such a snazzy gadget. It’s absolutely superb - we can’t sing it’s praises enough, and we will definitely gift it to other new parents. Great product for a very reasonable price. I bought it mainly to test baby's bath water temperature and it seems very accurate. So easy to use. Well packaged with instructions. Just requires 2 x AAA batteries. I love the fact that its non-contact, you just point at what you want to measure and press the button, the result comes up on an easy to read display. Much better than any other standard digital thermometers I've previously used. Fast delivery too. 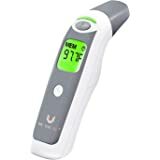 A four star surface thermometer, a one star person thermometer. Turns out measuring the surface temperature of a person isn't an acurate way to measure their internal temp. After having brought our baby to the doctor a few times to be told they had a termperature when this thermometer told us they didn't, we purchased an in ear thermometer, which is working great. I now use this in the kitchen, where it performs excellently. Big display, very easy to read plus the color alert which is brilliant. Touchless is so convenient and no need to replace and buy the sensor covers which is quite costly. 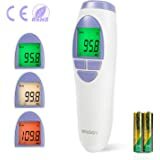 This thermometer is very easy to use. Using AAA batteries is an advantage as it’s cheap and can be purchase anywhere, anytime.